"So perfect is his control that each voice, like an individual bell in a handbell choir, rings true. Mr. Edgerton's gift is for dialect that places its speaker squarely—not only on a geographical map, but a psychological one." Reading, Learning, Teaching Clyde Edgerton: This book by Yvonne Mason discusses how to teach Clyde's books in secondary and college English language arts classrooms as a means of revitalizing curricula and challenging the ways we traditionally think about teaching. Lunch at the Piccadilly: A Musical. Music by Mike Craver, Book by Clyde Edgerton. Performed March 2006 by Cape Fear Regional Theatre at Playworks. Visit the official website. Stage adaptations by John Justice. Learn more about some of the music that has influenced Clyde through the years in this playlist for NY Times' blog "Paper Cuts." Musical talent runs in the family. Clyde's daughter performs with MIDTOWN DICKENS. Click to listen and buy a CD. Sometimes on the road, Clyde plays with the Rank Strangers: Matt Kendricks and Jack King. 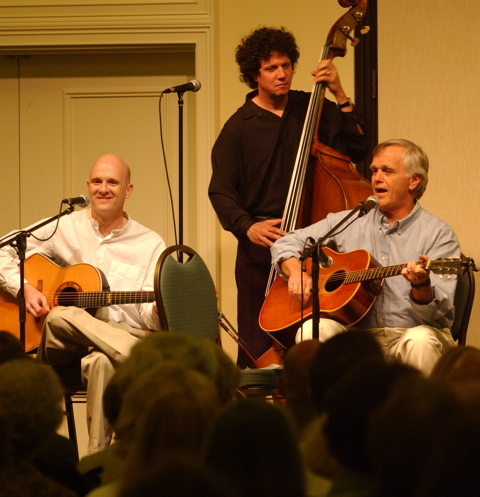 Matt and Jack are among the southeast's leading musicians. "Debra's Flap and Snap" appears in Image Journal's newly-released book, Bearing the Mystery. FAITH AND LEADERSHIP: Storytelling and Story Listening (An Interview) - Clyde talks about how teachers, preachers and leaders can use storytelling to engage their audiences--and why he has returned to church. Clyde Edgerton Papers Inventory: Online catalog of Clyde's papers and manuscripts maintained at the Library of the University of North Carolina at Chapel Hill. In 2002 a collection of materials by and about Clyde was given to Meredith College by Dr. Hilbert Campbell, Professor of English, Virginia Tech University. IndieBound.org: Find an independent bookseller near you. Clyde reads from his novel in this podcast for PLCMC. Clyde discusses the novel in an audio interview with Frank Stasio and Jon Hill for North Carolina Public Radio WUNC. Clyde's photos on this site were taken by Brent Clark, Kristina Edgerton, Nathaniel Edgerton and Mark Olencki. Credit to Stewart Butterfield for the bookshelf image used as this site's background. Thank you to webmistress Stephanie Trott, and to Rebecca Petruck and John Mortara for site design.